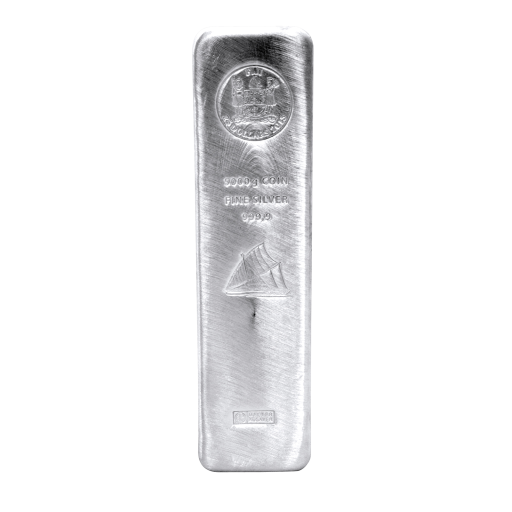 The 5 Kilo Fiji silver coin bar from the prestigious Argor-Heraeus Mint offers all the benefits of a coin in an elegant cast bar. As legal tender with a face value of 25 Fiji Dollars, it can be purchased VAT free. The traditional bar form is one that is preferred by many investors and a coin bar of this size is a great way to boost your portfolio. It's also the ideal choice for those who wish to place pension funds in precious metals. Each silver coin bar features the crest of Fiji with the coin denomination. 5000 g and coin are stamped underneath along with the 5 kg bar's purity of 999.9. A stylised clipper ship is an attractive finishing touch. CoinInvest.com is always on the lookout for products that offer its customers exceptional benefits - like this 5 kg coin bar. Certain to increase in value, bars of this calibre can be easily traded internationally. As a trusted supplier for some of the world's leading refineries and mints, we are able to buy larger quantities and offer our customers the lowest prices. This striking bar is ideal for new and established investors. CoinInvest.com ships all orders at the earliest opportunity allowing you to enjoy your purchases as quickly as possible.